Is Your Next Bus Driver A Computer? Local Motors Debuts 'Olli', a self-driving, 12-passenger electric bus in Washington, DC powered by IBM. 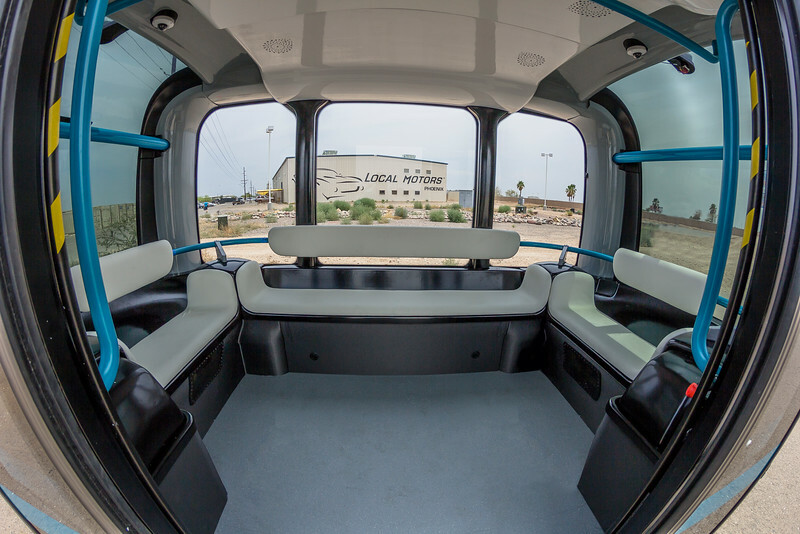 Local Motors, the leading vehicle technology integrator and creator of the world’s first 3D-printed cars, has introduced the first self-driving vehicle to integrate the advanced cognitive computing capabilities of IBM Watson. The vehicle, dubbed ‘Olli, is equipped with some of the world’s most advanced vehicle technology, including IBM Watson Internet of Things (IoT) for Automotive, to improve the passenger experience and allow natural interaction with the vehicle. Olli has been deployed on public roads starting this month in Washington, DC, and will expand to serve Miami-Dade County and Las Vegas in late 2016. Olli is the first vehicle to utilize the cloud-based cognitive computing capability of IBM Watson IoT to analyze and learn from high volumes of transportation data, produced by more than 30 sensors embedded throughout the vehicle. Using the Local Motors open vehicle development process, sensors will be added and adjusted continuously as passenger needs and local preferences are identified. Furthermore, the platform leverages four Watson developer APIs – Speech to Text, Natural Language Classifier, Entity Extraction and Text to Speech – to enable seamless interactions between the vehicle and passengers. Passengers will be able to interact conversationally with Olli while traveling from point A to point B, discussing topics about how the vehicle works, where they are going, and why Olli is making specific driving decisions. Watson empowers Olli to understand and respond to passengers’ questions as they enter the vehicle, including about destinations (“Olli, can you take me downtown?”) or specific vehicle functions (“how does this feature work?” or even “are we there yet?”). Passengers can also ask for recommendations on local destinations such as popular restaurants or historical sites based on analysis of personal preferences. These interactions with Olli are designed to create more pleasant, comfortable, intuitive and interactive experiences for riders as they journey in autonomous vehicles. Though officially introduced today, there is already immediate interest in putting Olli to use on public roads. Miami-Dade County is exploring a pilot program in which several autonomous vehicles would be used to transport people around Miami. Local Motors is a technology company that designs, builds and sells vehicles. The Local Motors platform combines global co-creation with local micro-manufacturing to bring hardware innovations, like the world’s first 3D-printed cars, to market at unprecedented speeds. To learn more, visit, www.localmotors.com. For more information about IBM Watson IoT, please visit www.ibm.com/iot or follow @IBMIoT on Twitter.